The LMV-803Lr on the test stand at Sundyne’s Arvada, Colorado manufacturing center last year. The Sundyne LMV-803Lr is an API 610 compliant pump available in either OH3 or OH5 motor mounting configuration that provides ultra-low NPSHr performance – approximately 5 ft (1.5 m), across the entire performance range – for flows to 800 GPM (180 m3 / hr) and heads to 1,000 ft (305 m). Sundyne says the ultra-low NPSHr allows the pump to be installed at grade level, eliminating the expense of installation in a pit and performing maintenance in a confined space. The vertical design is ideal for use in refineries, NGL, petrochemical and chemical plants, as well as handling light hydrocarbon handling services, such as bottom pumps for de-ethanizers. The company says the LMV-803Lr is its most rugged pump to date, delivering a compact footprint, low vibration and increased efficiency. 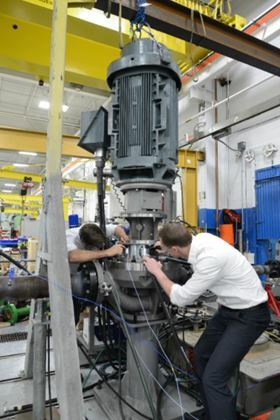 Featuring Sundyne inducer technology and a newly redesigned backswept impeller, it is claimed this model is capable of meeting lower NPSHr requirements than either BB2 or VS style pumps without risk of cavitation. Sundyne says the LMV-803Lr also boasts a robust new 6x4 casing that is engineered to operate reliably in extremely high-pressure applications with maximum case working pressures equivalent to 1,000 psig (70 kg / cm2).